Vitamin C (or ascorbic acid) is probably one of the most famous of the water soluble vitamins. It serves some vital functions such as being involved in the synthesis of collagen (the glue that holds your cells together, needed for healing and repair of tissue), L-carnitine (a well-known fat metaboliser), and some neuro-transmitters. Vitamin C is also a good antioxidant, and is needed for protein metabolism. So long story short, if you're low on vitamin C, you can forget about making any gains. Good sources of vitamin C include fruits and vegetables, especially citrus fruits. Orange juice is probably the best known source of vitamin C. But other good sources include red pepper, kiwi fruit, and broccoli. As mentioned above, vitamin C is important for a range of functions in the body. Many of these are important for day to day life, but some are relevant to bodybuilding. During exercise, large amounts of free radicals are synthesised and contribute to cell and muscle damage. It is thought that antioxidants such as vitamin C may play a role in protecting cells from oxidative damage. There is evidence that shows that when 1 g/day vitamin C was given to people, it significantly reduced oxidative stress from exercise, compared to those receiving a placebo (Alessio et al, 1997). It is possible that the effects of vitamin C may be even more beneficial for untrained people, or those undergoing a new exercise routine (Thompson et al, 2001). At high doses, vitamin C has an antihistamine effect (Johnston, 1996). 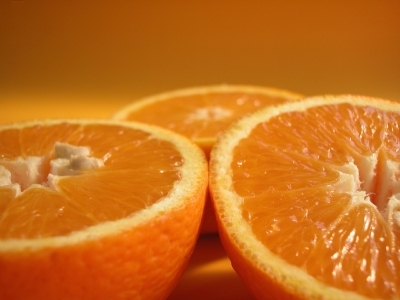 This may make vitamin C effective in being able to reduce the severity of cold and flu symptoms (Hemila, 2007). A speedier recovery from the cold means less down time from the gym. Vitamin C is a very safe vitamin. Excess is not stored and excreted in urine. However, taking large amounts may lead to stomach upsets and diarrhoea. It has been recommended that adults should remain below 2000 mg/day (NIH, 2011). Just like vitamin E, those undergoing chemotherapy may need to avoid antioxidant supplementation, as this may interfere with the destruction of cancer cells. Likewise, those taking statins for high cholesterol may need to avoid vitamin C supplementation (NIH, 2011). The recommended vitamin C intake for most adults is 90 mg for men and 75 mg for women. However, it is known that both smokers and those undertaking intensive training have a higher vitamin C requirement (NIH, 2011), possibly as a result of increased free radical production. Thompson et al (2001) showed that doses of 200 mg vitamin C taken twice a day was effective in reducing free radical damage during exercise. This is therefore the recommended dosage. Vitamin C can be taken with meals. Vitamin C is available as stand-alone tablets, often in a chewable form. This may contain either ascorbic acid, sodium ascorbate, and/or other vitamin C derivatives. Vitamin C can also be found in most multivitamins, and a huge range of supplements including antioxidant supplements, protein bars, weight gainers, concentrated pre workout supplements, and much much more. Be sure to look out for other names of vitamin C listed above. Vitamin C can be stacked with almost anything. It goes particularly well with vitamin E and selenium to work together as antioxidants. Vitamin C can also increase the absorption of iron, so you should definitely consider a vitamin C supplement if you are taking an iron supplement. Hemila (2007), The role of vitamin C in the treatment of the common cold. Am Fam Physician, 76: 1111-1115.